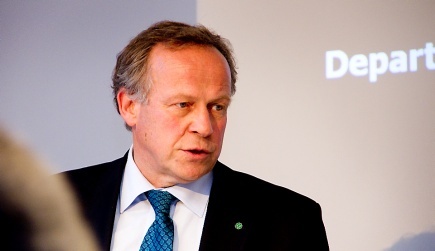 Can Norway and UMB contribute to solving the food crisis in Africa? This was the key question that brought the Norwegian minister of Agriculture and Food, Lars Peder Brekk, to Noragric on Monday. 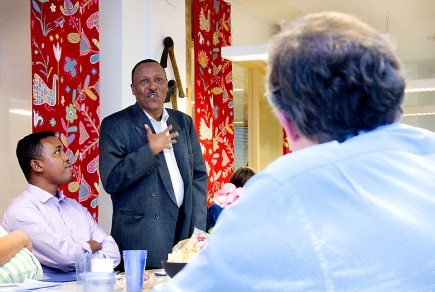 The minister was eager to listen to the views of researchers and students from the Horn of Africa during his visit. In his opening speech, the minister sketched the critical situation in the Horn of Africa which is suffering the worst drought in 60 years. Political conflict and extreme weather events call for country-driven “climate smart agriculture” and a more sustainable food production system, he said. Farming practices that sustain healthy soils, reduce negative impacts on the environment and enhance ecosystem services are essential for food security. He commended the UN’s Updated Comprehensive Framework for Action which offers a framework for how the global community should proceed. The minister emphasized that all countries have a responsibility to provide food for their own population. Professor Ruth Haug said that there is a food crisis as long as there are hungry people in the world. To the question “why is there hunger?” she referred to reasons cited in the past such as production, economic and political failures and, more recently, structural injustice. The “African agricultural tragedy” sees some countries with a surplus whilst others do not have enough food to feed their population. Agro-investment, lower food prices, better international food relief and more research into understanding agricultural policies in developing countries is needed. Among others, Dr Trygve Berg briefly talked about the challenges facing in particular the poor farmers: regular price collapses and the inability to exploit the market, but also the lack of infrastructure. Policy reforms must come first, then productive technologies, and finally a functional market must be in place to convert productive capacities into economic growth. Dr Jens Aune presented the principles and advantages of conservation agriculture which, he pointed out, is the only system that can feed 9 billion people in a sustainable way. This form of agriculture should also be promoted more in Norway. Representatives from the Somali and Ethiopian student and researcher community at UMB gave the minister their insight into the contributing factors leading to the current disaster. Lack of proper institutions, a fragile government, radical groups such as Al-Shabab, land- and water conflicts and no market are some of the underlying causes aggravating the situation in Somalia. In Ethiopia, a lack of access to water and the effects of climate change on agriculture output were cited as some of the main reasons for the hunger situation in the country. There is a need for an agricultural system which produces 3-4 times per year and crop varieties that can cope with climate change. Brekk summed up the one-hour meeting by pointing to the importance of research at Noragric/UMB in finding solutions to Africa’s challenges. He referred to the cross-sectoral research carried out at Noragric interlinking food production and poverty, gender issues, property rights, environmental management, conflict, and peace building. Approaches to food security and agriculture must deal with all these issues as a whole. Involving students from the affected areas is important when addressing the challenges faced by their home countries. 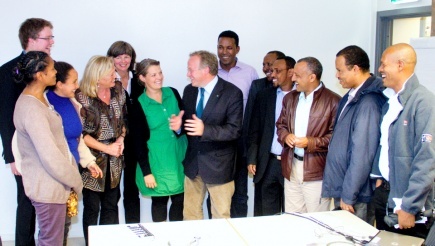 The minister expressed the need to look at the connection between the challenges in Norwegian agriculture policy and the global problems in agriculture and development. “The visit to UMB has given us knowledge that will help in our efforts with relief assistance and finding solutions to the food crisis in Africa. Each country has different challenges and it is not easy to find one solution that applies to all. It is, however, important to focus on local production and a functional market system as the basis for bringing these countries out of this crisis situation," Brekk said. Being a partner for research and agricultural development, he concluded, Noragric is a good example of the role of Norway in promoting global food security.